Its hard to imagine a more exclusive car than the new LaFerrari, but Ferrari design chief says an extreme version of the supercar is already being planned. When the new Ferrari LaFerrari hybrid super car from Maranello was unveiled in Geneva, we were told that the high-performance sports car would be very exclusive and that only 499 examples would be built. Shortly after the supercar made its global debut, Ferrari said that more than twice the number of requests had already been received by the Italian automaker. Those buyers will make up one of the most exclusive clubs in the world. But does Ferrari have something even more exclusive planned for the LaFerrari? In an exclusive interview with AutoCar, Flavio Manzoni LaFerrari’s chief designer revealed that the Italian sports car maker already has plans to build an even more extreme and exclusive version. He told them “plans are already being made for a more exclusive version of the car to be sold in very small numbers.” And while Manzoni didn’t reveal exactly how many of these ultra-exclusive LaFerrari’s would be produced, AutoCar says it will be fewer than 10 total cars. If we think that the 499 LaFerrari owners will be in the most exclusive auto club in the world, the 10 or fewer owners will be in rarified air compared to the original 499. And the price of the new ultra-exclusive supercar is reported to be between $4.7 and $7.8 million. If this is accurate, it explains why fewer than 10 of these super sports cars will be built. This will be a very exclusive ownership group indeed. It will be truly special and very close to a one-off ultra-sports car. 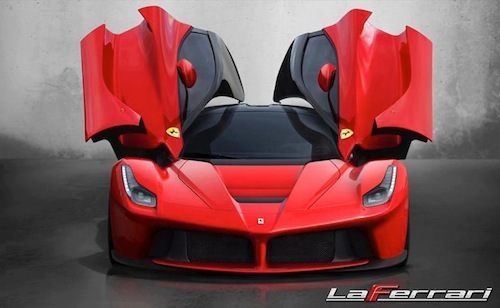 And the new LaFerrari will be even more extreme than the original car that we saw in Geneva. The ultra-extreme LaFerrari could weigh in as little as 1000kg. The current model is super light and has a curb weight of just 1255kg. And if the new supercar gets the same engine and hybrid drivetrain with 963 combined horsepower, it will be scary fast at this new weight. We just have to wonder what this new ultra-exclusive and more extreme LaFerrari will look like. If it’s anything like the design chief says, it will be truly beautiful and special. Stay tuned.